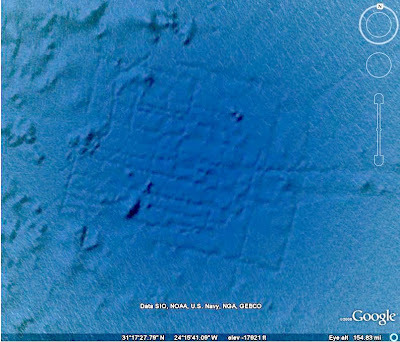 Home » atlantis , geography , google earth , weird news » Has Google Earth found Atlantis? Has Google Earth found Atlantis? It's said to be as large as Wales, and sits beneath three and a half miles of water. Some are saying that Google Earth might have stumbled upon the location of fabled Atlantis. Interestingly, the site does rest in the spot beyond the Strait of Gibraltar where Plato said Atlantis rose and fell. My hunch is that this is going to turn out to be some natural feature on the eastern flanks of the Mid-Atlantic Ridge. But it is plenty intriguing that it looks so regular and organized, almost like the layout of a city. Looks very interesting, the sea must of rised a lot if it is mind. It's also interesting that it is only a few hundred miles from the 'atlantis seamount'.